Browse the latest Glencairn Village real estate in East Regina below! Glencairn and Glencairn Village are located in the Dewdney East region of Regina and is one of Regina’s largest neighbourhoods by area and population. Glencairn Village real estate combine post-war style housing and multi-family dwellings. This family friendly community has seven elementary schools and one high school. 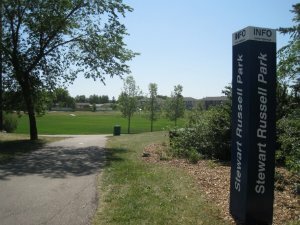 It's also home to several neighbourhood-level parks and one zone-level park serving the ball and soccer communities. Homes in Glencairn are affordable and popular to revenue investors. Check out the incredible Glencairn Village homes for sale found below, or continue reading about East Regina's largest, and most popular community! The charm of Glencairn and Glencairn Village homes for sale is the stately mature landscaping. Grassy front yards with tall elm trees and colourful flower beds offer instant curb appeal to the community. New home owners are rejuvenating this community with modern renovations to the exteriors and interiors of these bungalows, bi-levels and split level homes that are predominately found throughout Glencairn and Glencairn Village. Glencairn provides lots of entertainment for every age group. The Clarence Mahon Ice Arena has public skating for the entire family. Cheer on your future hockey players as they practice their skating skills. Are you up for 5 pin or 10 pin bowling? Book a lane at the Glencairn Bolodrome. Check out the activities at the Glencairn Neighbourhood Recreation Centre. This facility offers a multi-purpose gym (capacity: 300 people), large meeting room (capacity: 100), games room and kitchen facilities. Just a short drive, walk or bus ride will take you to Victoria Avenue and all the retail and commercial services you could need. Employment opportunities at the many businesses along Victoria Avenue make Glencairn and Glencairn Village a convenient home for work and pleasure. Interested in learning more about the Glencairn Village homes for sale? Take a moment to contact the Tourney Group online or call 306-789-1700 and chat with an experienced, local Regina real estate professional.